He received a B.A. in English at the University of Wisconsin–Madison where he developed interests in history, philosophy and architecture. It was at this time that he saw Stanley Kubrick's Dr. Strangelove and fell in love with movies. In a recent L.A. Weekly interview, he describes the film's impact on him: "It said to my whole generation of filmmakers that you could make an individual statement of high integrity and have that film be successfully seen by a mass audience all at the same time. In other words, you didn't have to be making Seven Brides for Seven Brothers if you wanted to work in the mainstream film industry, or be reduced to niche filmmaking if you wanted to be serious about cinema. So that's what Kubrick meant, aside from the fact that Strangelove was a revelation." He then received his MA at London Film School. His daughter Ami Canaan Mann is also a film director and producer. Mann later moved to London in the mid 1960s to go to graduate school in cinema. He went on to receive a graduate degree at the London Film School in 1967. He spent seven years in the United Kingdom going to film school and then working on commercials along with contemporaries Alan Parker, Ridley Scott and Adrian Lyne. In 1968, footage he shot of the Paris student revolt for a documentary, Insurrection, aired on NBC's First Tuesday news program and he developed his '68 experiences into the short film Jaunpuri which won the Jury Prize at Cannes in 1970. Mann returned to United States after divorcing his first wife in 1971. He went on to direct a road trip documentary, 17 Days Down the Line. Three years later, Hawaii Five-O veteran Robert Lewin gave Mann a shot and a crash course on television writing and story structure. Mann wrote four episodes of Starsky and Hutch (three in the first series and one in the second) and the pilot episode for Vega$. Around this time, he worked on a show called Police Story with cop-turned-novelist Joseph Wambaugh. Police Story concentrated on the detailed realism of a real cop's life and taught Mann that first-hand research was essential to bring authenticity to his work. His first feature movie was a television special called The Jericho Mile, which was released theatrically in Europe. It won the Emmy for best MOW in 1979 and the DGA Best Director award. His television work also includes being the executive producer on Miami Vice and Crime Story. Contrary to popular belief, he was not the creator of these shows, but the executive producer and showrunner. They were produced by his production company and his cinematic influence is felt throughout each show in terms of casting and style. Mann is now known primarily as a feature film director. He has a distinctive style that is reflected in his works: his trademarks are intricate scene setups, during Miami Vice to such an extent that a whole scene was completely color-coordinated, from props to backgrounds to actors' wardrobes, as well as powerfully-lit night scenes and combining exterior filming in such a way that shots of completely unrelated filming locations can appear as being of the same building or landmark. In terms of sound, he is known for unusual scores, such as Tangerine Dream in Thief or the new-age score to Manhunter. Dante Spinotti is a frequent cinematographer of Mann's pictures. Mann's first cinema feature as director was Thief (1981) starring James Caan, a relatively accurate depiction of thieves that operated in New York City and Chicago at that time. Mann used actual former professional burglars to keep the technical scenes as genuine as possible. His next film The Keep (1983), a supernatural thriller set in Nazi-occupied Romania, was an uncharacteristic choice. [original research?] Though it was a commercial flop, the film has since attained cult status amongst fans. In 1986, Mann was the first to bring Thomas Harris' character of serial killer Hannibal Lecter to the screen with Manhunter, his adaptation of the novel Red Dragon, which starred Brian Cox as a more down-to-earth Hannibal. In an interview on the Manhunter DVD, star William Petersen comments that because Mann is so focused on his creations, it takes several years for him to complete a film; Petersen believes that this is why Mann does not make films very often. He gained widespread recognition in 1992 for his film adaptation of James Fenimore Cooper's novel into the epic film The Last of the Mohicans. His biggest critical successes in the 1990s began with the release of Heat in 1995 and The Insider in 1999. The films, which featured Al Pacino with Robert De Niro in Heat and Al Pacino and Russell Crowe in The Insider, showcased Mann's cinematic style and adeptness at creating rich, complex storylines as well as directing actors. The Insider was nominated for seven Academy Awards as a result, including a nomination for Mann's direction. With his next film, Ali (2001), starring Will Smith, he started experimenting with digital cameras, while Smith was nominated for an Academy Award for his performance. For his crime film Collateral, which cast Tom Cruise against type by giving him the role of a hitman, Mann shot all of the exterior scenes digitally so that he could achieve more depth and detail during the night scenes while shooting most of the interiors on film stock. In 2004, Mann produced The Aviator, based on the life of Howard Hughes, which he had developed with Leonardo DiCaprio. The Aviator was nominated for an Academy Award for Best Picture but lost to Million Dollar Baby. After Collateral, Mann directed the film adaptation of Miami Vice which he also executive produced. It stars a completely new cast with Colin Farrell as Don Johnson's character Sonny Crockett, and Jamie Foxx filling Philip Michael Thomas' shoes. Mann served as a producer with Peter Berg as director for The Kingdom and Hancock. Hancock stars Will Smith as a hard-drinking superhero who has fallen out of favor with the public and who begins to have a relationship with the wife (Charlize Theron) of a public relations expert (Jason Bateman), who is helping him to repair his image. Mann also makes a cameo appearance in the film as an executive. In the fall of 2007, Mann directed two commercials for Nike. The ad campaign "Leave Nothing" features football action scenes with former NFL players Shawne Merriman and Steven Jackson. In 2009, Mann wrote and directed Public Enemies for Universal Pictures, about the Depression-era crime wave, based on Brian Burrough's nonfiction book, Public Enemies: America's Greatest Crime Wave and the Birth of the FBI, 1933–34. It starred Johnny Depp and Christian Bale. Depp played John Dillinger in the film, and Bale played Melvin Purvis, the FBI agent in charge of capturing Dillinger. In January 2010 it was reported by Variety that Mann, alongside David Milch, would serve as co-executive producer of new TV series Luck. The series was an hour-long HBO production, and Mann directed the series' pilot. Although initially renewed for a second season after the airing of the pilot, it was eventually cancelled due to the death of three horses during production. On February 14, 2013, it was announced that Mann had been developing an untitled thriller film with screenwriter Morgan Davis Foehl for over a year, for Legendary Pictures. In May 2013, Mann started filming the thriller, named Blackhat, in Los Angeles, Kuala Lumpur, Hong Kong and Jakarta. The film, starring Chris Hemsworth as a hacker who gets released from prison to pursue a cyberterrorist across the globe, was released on January 16, 2015 by Universal. It received mixed reviews and was a commercial disaster, although many critics included it in their year-end "best-of" lists. In January 2015, it was reported in The New Yorker that Mann is developing a film about Ferrari founder Enzo Ferrari. Christian Bale was originally cast to play the title character, but later dropped out citing health concerns due to rapid weight gain required to shoot as per schedule. Financing is coming from Vendian Entertainment in the United States and China's Bliss Media. Distribution rights have already been purchased by Paramount for the US and Bliss Media for China. Mann directed the 2002 "Lucky Star" advertisement for Mercedes-Benz, which took the form of a film trailer for a purported thriller featuring Benicio del Toro. Mann also directed the 2008 promotional video for Ferrari's California sports car. In 2009 Mann also directed a commercial for Nike that featured several stylistic cues, most notably the use of "Promontory" from the soundtrack of The Last of the Mohicans. 1977 Police Woman Yes Episode "The Buttercup Killer"
1984-90 Miami Vice Yes Yes Wrote episode "Golden Triangle"
^ Editors. "Michael Mann". Encyclopedia Britannica. Retrieved November 18, 2017. ^ "The Greatest Directors Ever". Total Film. August 20, 2007. Retrieved May 20, 2008. ^ "25 Greatest Active Film Directors". Entertainment Weekly. Retrieved February 19, 2009. ^ Brooks, Xan (February 13, 2002). "Ali likes the film a lot. He's seen it six times". The Guardian. London. Retrieved May 12, 2010. 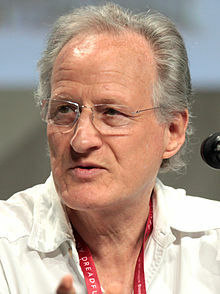 ^ "Michael Mann Biography (1943-)". ^ "Michael Mann bio". NNDB. ^ Atkinson, Claire (October 27, 2007). "Sure, He can Direct Movies, but Can He Do Commercials?". New York Times. Retrieved September 9, 2008. ^ Garrett, Diane (December 5, 2007). "Johnny Depp goes Public". Variety. Retrieved December 4, 2007. ^ Fleming, Michael (January 5, 2010). "Mann, Milch in Luck with HBO". Variety. Retrieved May 26, 2010. ^ Kroll, Justin (February 14, 2013). "Mann, Hemsworth team for Legendary thriller". Variety. Retrieved February 14, 2013. ^ "Cyber (2015) – Filming Locations". IMDB.com. June 5, 2014. Retrieved June 5, 2014. ^ Richard Brody, "The Odd Shadow Over Michael Mann's New Movie," The New Yorker, January 16, 2015. ^ Dietz, Jason (December 6, 2015). "Best of 2015: Film Critic Top Ten Lists". Metacritic. CBS Interactive Inc. Retrieved February 12, 2016. ^ Tad Friend, "Amygdala Report," The New Yorker, January 26, 2015. ^ Child, Ben (January 18, 2016). "Christian Bale abandons Enzo Ferrari biopic over weight gain fears". The Guardian. ISSN 0261-3077. Retrieved March 18, 2016. ^ Jaafar, Ali. "Christian Bale Exits Michael Mann's 'Enzo Ferrari,' Balks At Weight Gain". Deadline. Retrieved March 18, 2016. ^ "Paramount swoops on 'Enzo Ferrari'". www.screendaily.com. Retrieved March 18, 2016. ^ a b c d e f g h i j k Michael Mann on Rotten Tomatoes. Retrieved September 1, 2018. ^ a b c d e f g h i j k Michael Mann on Metacritic. Retrieved September 1, 2018.